It’s not about YOU….it’s about Jesus. To momentarily stop the music on the slideshow below so you can hear Mark speak, just click on the volume/mute button in the bottom left hand corner of the pictures. Chrissy is gonna be a mommy! Chad and Chrissy are gonna be parents for the first time. We love them so much and I’m so glad that Andrew got to be in Chrissy’s class this year, her last before the baby arrives in May. 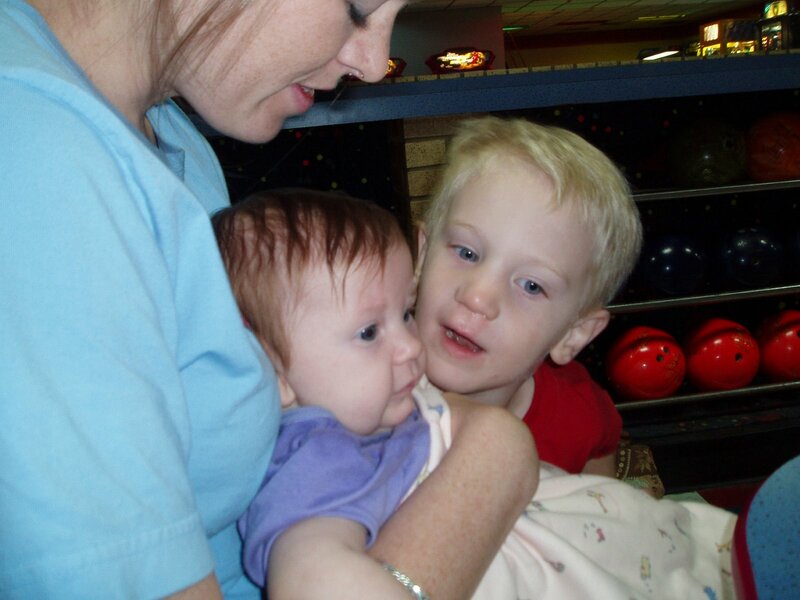 Our small group went bowling last night and we caught her enjoying a moment with Andrew and Abigail (thanks to Elizabeth’s camera!). I think she’s gonna be a great mom! This is too cute. I just had to post it. Notice the spit and drool as she talks super fast. She’s quite a submissive and obedient child, too. Scroll down to the bottom of my blog to pause the music from playing over the video. …get to drive themselves for once. Shhhhh! Don’t call me! All three kids are sleeping right now. No way, is that the trash man? That truck is so loud. Oh, I hear a baby…..I think I’ll let ’em cry. Why does the neighbor have to drive a diesel and leave during naptime everyday? I smell a poopy….it will just have to wait. They can sleep in “it”. Am I actually on the computer and getting much needed things accomplished without a tiny tot scrambling up my leg to play Thomas the Tank Engine or the Wiggles online? Gotta go lest the three kiddos hear me typing. For those of you with more than one child, do you ever feel like others don’t want you around or would rather you leave because of your offspring? Just a few weeks ago, we took all three kids out to eat at a really nice restaurant on the marina in Panama City Beach (some of you already know which one I’m talking about). The older two didn’t want to wait on their food (did I mention they are ages 3 years and 21 months?) and didn’t care to eat it when it finally arrived. I think I took L to the restroom three times to have a little “talk” before the hushpuppies were placed before him. Hubby had already taken A out twice so it was, once again, a high-priced meal that wasn’t enjoyed. We know and hear that this is “normal” (right?) childhood behavior. More importantly, I am reminded that our hearts are dirty and ALWAYS want our own way. Of course, obedience is also something to be taught and expected so, through times such as this one, we hope to have instilled some of that wisdom (I need that same discipline as an adult). We also believe that children are treasures, gifts from God above….although not perfect. We want to enjoy our children and hope that others see them as precious but understand that their hearts are evil, wicked, and depraved. Some may think those are harsh adjectives but they are true and we teach our children to answer this way about their own hearts when asked, “What’s wrong with your heart?”. We want them to be fully aware of their fallen state and their desperate need for a Savior who loves them enough to wash their heart clean and turn it from stone to flesh! So, I was reminded of my own depraved heart when, after Hubby took A and L out of the restaurant to go look at the boats outside, a lady leaned over to me and said, “Mam, I really appreciate your husband taking the disruptive kids out of the restaurant. It makes a much more pleasant experience for the rest of us who are dining. Most parents won’t do what you did so I applaud you.” Of course, at this point I was already steaming from the sheer anger towards my own children as well as at my own self for being so angry in the first place. I was sweating and just wanted someone to say, “You’re a good mom and are doing a wonderful job, what with being a parent who is a sinner to three little sinners”. I just looked at the lady and smirked and kept my mouth shut. I love my life.